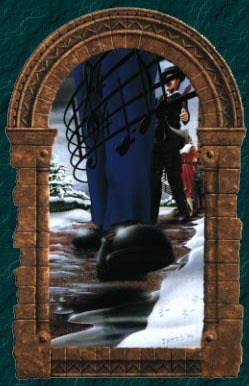 A King's Ransom written by club founder Dan James, was the last ever puzzle to appear concerning the book Treasure. It appeared in the July 1998 issue of the newsletter. The prize was an original painting of Charles I, framed in bronze, which appeared in Dan's book Treasure, along with the only existing 22 carat gold lute key ever to be made. Once the clues were deciphered, they led to a small stoneware casket containing the gold key. The painting, along with the key, was presented to the winners - Martin Dennett and Paul Harkin nine months later, after successfully locating the casket.